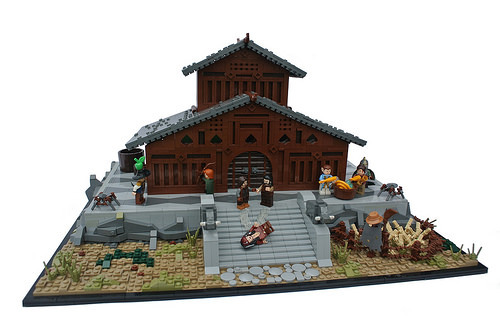 Patrick B has created a traditional wooden tavern that lies in the fictional kingdom of Brandküste, one of nine kingdoms from an online role-playing game on the German-language LEGO fansite Imperium der Steine. The tavern has some lovely architectural details and a sloped roof with a mix of tiles and studs on show to add texture. The character details are fun and engaging: an archer aims his arrow at the apple on top of his friends head, there’s a basin of water being used to wash some of the dishes and a comedy moment as some poor soul falls down the stairs. Does anyone else agree that the two statues on the staircase are wild boars? I may have to check with the builder as I am not an expert in zoology. If the roof were yellow, I’d say this was Meduseld. I don’t have the book handy to check the description, but this perfectly fits my mental image.